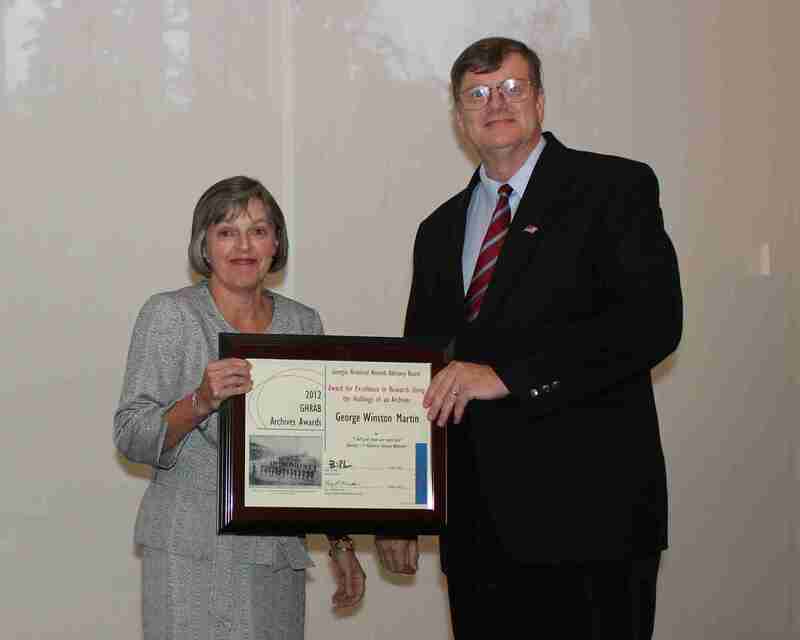 Receiving the 2012 “Award for Excellence in Research in Using the Holdings of an Archives,” from Kaye Minchow, GHRAB Chair. Me with Marsha Luttrell, Publishing Assistant, Mercer University Press. Me with Mike Webb at Scott’s Book Store. Mike is a member of Sons of Confederate Veterans William Thomas Overby/Coweta Guards Camp #715, and arranged for my appearance in Newnan. Me with John Carroll, former commander of the Sons of Confederate Veterans A. H. Stephens Camp #78. Camp #78 represents several companies formed in Sumter County, one of which was the Muckalee Guards, Company A of the Twelfth Georgia Infantry. The Twelfth fought alongside the First Georgia during the Cheat Mountain Campaign and the Battle of Greenbrier River. Speaking to the Perry Historical Society at the Old Perry Hotel. The Southern Rights Guard, which was Company C of the First Georgia, was formed in Perry and Houston County. Many thanks to Terre Walker for her kind invitation, and to the Society for their warm welcome. Signing books at the Mercer University Press table. Thanks to all who stopped by! A discussion of the two brothers, William Henry Marshall and Cummings Marshall, along with their family, who are buried in the Colebrook Village Cemetery. William Henry was in the Dahlonega Volunteers, Company “H” of the First Georgia Volunteer Infantry. Cummings served in Company “I” of the First New Hampshire Heavy Artillery, posted at Battery Reno near Washington, DC. My thanks to Ellie Gooch for her invitation, and to the Society for the enthusiastic welcome I received.